Don’t let a CMS get in the way of shipping software. Contentful provides a content infrastructure that enables teams to power content in any digital product. IT JUST MAKES YOUR LIFE EASIER No Security issues Trivial caching Without a server-side application or CDNs are trivial to set up. Since every database the attack surface is minimal. file gets delivered to every user as-is, no complex logic is necessary. Great performance Easy maintenance Shuffling bytes from storage to the No random 500 errors, no dropped network is what servers are great at. database connections. COMBINING STATIC SITES AND SERVERLESS Isolated services improve security Easy caching Every dynamic function is a limited Dynamic resources are hidden behind service with only the necessary permissions. APIs and well defined routes everything else can be cached. Great performance Easy maintenance Static things are instant; dynamic Most services can be handled by 3rd things are fast. parties requiring no maintenance. View Dynamic Static Sites on Notist. Static websites first came about with the dawn of the internet. Being fast, secure, and easy to maintain, it’s no wonder they’re still incredibly relevant. Using 3rd party APIs, you can get the best of both worlds: all the upsides of static sites, plus the feel and function of a dynamic one. 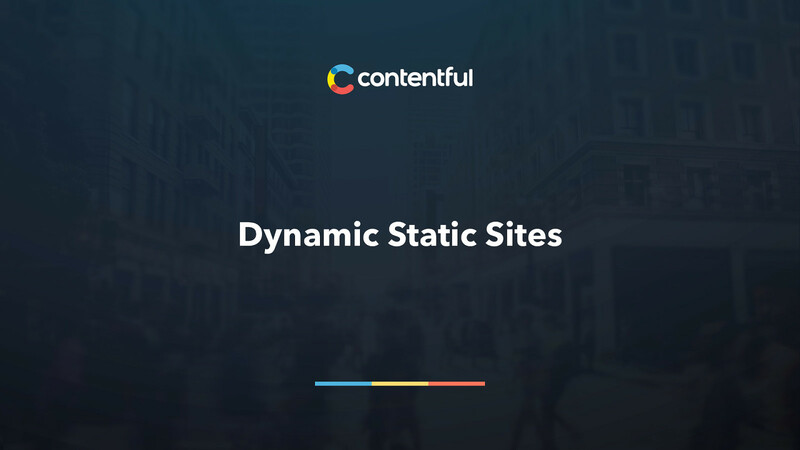 In this talk Shy Ruparel, developer evangelist at Contentful, examines the history of static sites, their benefits and how to make them dynamic.